Johann Gottlieb Goldberg was a pupil of both Wilhelm Friedemann and Johann Sebastian Bach. The Goldberg Variations were named for him; he may have been their first performer. Born in Danzig in 1727, he showed early gifts as a keyboard player when taken under the Bachs' wings in Dresden and Leipzig respectively. By 1751 he was back in Dresden and died there five years later, at only 29. We know precious little else, except that his prodigious talent at the harpsichord was legendary, but may have come at great cost. His manic performances were accompanied by extreme melancholy and self doubt: he destroyed much of his own work and seems to have consistently disparaged the rest. Partly as a result, only two cantatas and harpsichord concerti, various keyboard miscellanea – and the trio and quartet sonatas recorded here – survive. Of the latter, five are recorded from new editions; the sixth, the F Minor sonata [tr.s26-29], has usually been conjectured actually to be by Quantz – in part because the recently discovered score (also used on this CD) exists in the Saxon State Library with such an attribution. What will probably strike you first and most forcibly is the richness of Goldberg's contrapuntal writing. Complex almost to the point of confusion, the technique nevertheless has a wonderful way of imposing unity and integrity on the music. Musica Alta Ripa grasp and execute the spirit and the letter of the contrapuntal writing marvelously. Theirs is a supremely confident, somewhat restrained and gently introverted approach (listen to how they let the A minor sonata's allegro assai [tr.4] find its own level), which nevertheless draws none of the teeth from the music. It's balanced and poised music; Musica Alta Ripa plays it with a grace and aplomb that make this CD very easy to warm to on first hearing. Significantly, the musicians of the now quarter century-old ensemble capture the mood of the music, be it melancholy, delight, earnestness or nonchalance. They play mostly on period instruments, though their comfort with the idiom and style of Goldberg is due to much more. As fugues develop, and almost threaten to envelop the listener (from the allegro of the A minor sonata [tr.2] onwards), the players keep their calm, want us to appreciate that they are in control and mindful of the widest possible purpose of each movement. Goldberg is not aiming for spurious effect, but for genuine evocation of feelings. These musicians know that. This is not to say that the approach of Musica Alta Ripa is in any way lazy, negligent. Yes, they are somewhat generous in tempi and the various points of thrust, when themes would otherwise fall over one another. But they take this line in order to let the music breathe; to allow every textural nuance to emerge; above all, to reveal the structure of these half dozen intriguing sonatas. 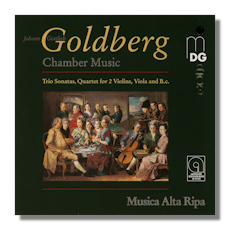 Tonally, the works make best sense for Goldberg when the relationships between keys and tempi are at their most exposed: the contrast in atmosphere between, say, the first two movements of the C Major sonata [tr.s5,6]… adagio then alla breve. For this contrast to work, and for the ensuing largo [tr.7] to be as languid as it needs to be, it makes no sense to rush or lose the sense of architecture of the piece. In short, the precision and variety which Musica Alta Ripa (five strings and harpsichord) bring to this pleasing music means that all four movements of each sonata are played in such a way that they are shown all to be contributing to the same work. The composer clearly has an enduring idea in his mind. Similarly, the ensemble's control of tempi and sense of direction during the ebullient fourth movement of the C Major sonata, for example [tr.8], is equally thoughtful and disciplined – to great effect. In that respect, there is something very immediate about these performances. They're not string quartets, though the tone of the performance and recording has the intimacy of a group playing with the kinds of interdependence and familiarity that quartets have. One can never quite use the word "informal" for the very accomplished style here. Still less "relaxed". The players are, rather, supremely in control; they impose the necessary rigor through familiarity and the confidence that such passages as the largo of the C minor sonata [tr.11] have their own logic; it will inevitably be revealed – especially when taken with the magnificent fugal allegro that follows. Musica Alta Ripa is aided by MD&G's famed attention to the recording environment. In this case the recording was made in the Schloß Nordkirchen in Oranienburg in Brandenburg, Germany. It's a dry and close acoustic and truly is suited to the intimate yet at times proclamatory tenor of the music… listen to the unfolding of the A Minor's allegro assai [tr.4], for example. The six solo keyboard Polonaises (Goldberg composed 24 in total) are quite different. Their more lyrical, less frenetic, style makes a pleasant contrast with the heavily mathematical drive and swirl of the sonatas. All in all, the feeling with which you come away from careful and repeated listening to this CD is of immense peace and satisfaction. Golderg never over-reached himself; his ideas are fresh and beautifully executed. The expert soloists of Musica Alta Ripa do him more than justice. Unhesitatingly recommended as an introduction to a composer with much to offer; and as an hour and a quarter's splendid music making in its own right.